Kristan Higgins is one of my only go-to adult romance authors these days. Her books are funny, sweet, and a little sassy -- all of which I've mentioned before. Her last few books have been part of her Blue Heron series, set in a small town in Western New York's wine country. This book is different in a couple of ways: one, it's the start of a new location series, and two, it's told from the perspective of two sisters, their lives and stories separate but intertwined. I enjoyed this slight change of format from Higgins' usual m.o. This book was also a bit different in that the romances themselves weren't entirely straightforward. Jenny Tate, a wedding dress designer, moves back to her hometown to open her own shop. She's looking forward to the opportunity, but also looking forward to putting some distance between her ex-husband and his perfect family -- who are oddly her best friends, and Jenny's probably the only one who doesn't think that's a little odd (and unhealthy). Fortunately, a friendship-turned-maybe-something-more with her enigmatic neighbor Leo might just giver her a change of perspective. Her sister Rachel has a seemingly perfect suburban family life....except it's not. When she discovers her husband is having an affair, her whole life turns upside down. She questions her marriage, her choices, and herself. Rachel's story is less of a] romance than it is a story about her relationships with friends, family, and even herself. I do love that the duel-narrative gives Higgins the opportunity to tell more than just a boy-meets-girl romance (although obviously I love a boy-meets-girl romance). My only complaint with this book is that I kind of wish there was a little more of each sister's story, the downside to having to heroines. But since I'm pretty sure this is the start of another series, maybe the next book will give a peak at what's been going on with Jenny and Rachel. 1. Instagram. You can all stop using it now, because I'm clearly so late to the party that it's gotta be last call. Kidding. Sort of. I did sign up for Instagram last week, and I may be a little enamored. 2. Popcorn. I think it's my friend Tess who doesn't like popcorn? Sad. I've got a big bowl sitting on my desk right now and it's delightful. The downside to having kiddos who often eat really early is that I'm hungry again before bed. The upside to having kiddos who often eat really early is the legitimate excuse for a snack. I love snacks. 4. The new Needtobreathe album came out (HARDLOVE) and it just gets better every time I listen to it. 5. Anyone else out there ever noticed that there are runners, and there are people who run. And there's a difference. And it has nothing to do with how far or how fast you run. 6. I've picked up a new book -- an actual hardback book, that I got for Christmas -- The Way of All Fish, by Martha Grimes. I'm having trouble getting momentum, mostly because I've only been able to read it in five minute increments. I can tell I'll like it (Martha Grimes, after all), but with her books I tend to need a good hour of solid reading to start off. Monday list - Happy Fourth of July! 1. I was griping about neighborhood firecrackers yesterday -- and I stand by my irritation at inconsiderate neighbors -- but I do enjoy Independence Day. A good, old fashioned, summer-time, celebration holiday. We're not really doing much since Jeremy's working today, but I'm listening to the Hamilton soundtrack to feel appropriately festive. And we ate hot dogs for lunch. What's more Fourth of July than that? 2. Less than a week until Sooner Youth Camp! Can't wait. I'm feeling a little bit like I should be packing already, but there's only so much I can do ahead of time. I've got my lists made at least. 3. I'm in a blog rut. When I was working as a librarian, I had a pretty extensive list of book and library related blogs that I read regularly. But I'm not reading at a quick pace at the moment, plus I'm not needing to perform readers' advisory (i.e., stay current on what's out there book-wise), and I'm not actively developing professionally, which just means that a lot of those blogs became more of a chore than enjoyable. I still enjoy their content, I just can't keep up and don't feel like I'm really retaining the information in a way that will be meaningful to me later. But I enjoy reading good blogs. It's like reading a magazine to me. I have a few that I read regularly still, but I feel a little bit like I need something fresh, something that feels more relevant to my life now. (not necessarily mommy-blogs, though. Just different book blogs, or writing blogs, or Jesus blogs, or cooking blogs...I don't even really know what I'm looking for). 4. I need a 5k to sign up for. I signed up for one in May, but it got rained out and rescheduled, and due to some poor communication on the part of the race organizers, I missed the new date. So...I need something to help keep me motivated during the long, hot, humid summer. Besides chocolate. 5. 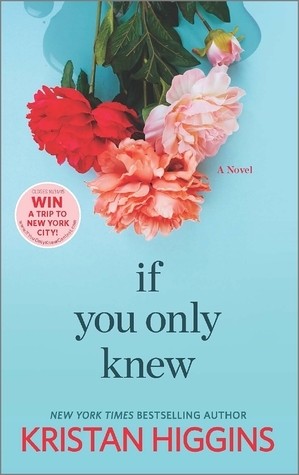 I'm working my way through a non-fiction book right now (Start, by Jon Acuff) and a quick romance (If You Only Knew, by Kristan Higgins).